Behind the paper "The Many flavors of photometric redshifts"
It has been a fun, rewarding and a enlightening experience to write the review on photometric redshifts (photo-z, i.e. the technique that allow to estimate the distance of galaxies by using their images observed through a set of filters). It was a fun experience since three of us know each other already well from various collaborations, and it was fun to have again a project together, and only the three of us, while we usually work in much larger teams. It was more streamlined, dynamic and personal. Mara was the first one to be contacted by Nature Astronomy to write this review because of the excellent recognition in the community for her work and passion on Active Galactic Nuclei (AGN). About a decade ago, Olivier and Mara were working extensively together on the same project, the “COSMOS survey” (http://cosmos.astro.caltech.edu/), with the goal of measuring photo-z for a million of galaxies and thousands of AGN in the high redshift Universe, using (then) state of the art imaging data from HST, the Subaru and the Canadia-France-Hawaii telescopes. The collaboration was an overwhelming success, enhanced by the pleasure of working in the great spirit of the COSMOS team. Therefore, they were happy to have a new project together, especially on photo-z. However, they are expert on the traditional template-fitting technique, without extensive experience on machine learning. From the beginning, we (Olivier and Mara) decided that a review on photo-z techniques must include machine learning, a method which becomes more and more important in any astrophysical problem. So, we asked Ben, expert in machine learning, to join our review team. We all know each other through our work for the Euclid project, which is the ESA mission that will be launched in 2021, that has the ambitious goal of determining the nature of Dark Energy. 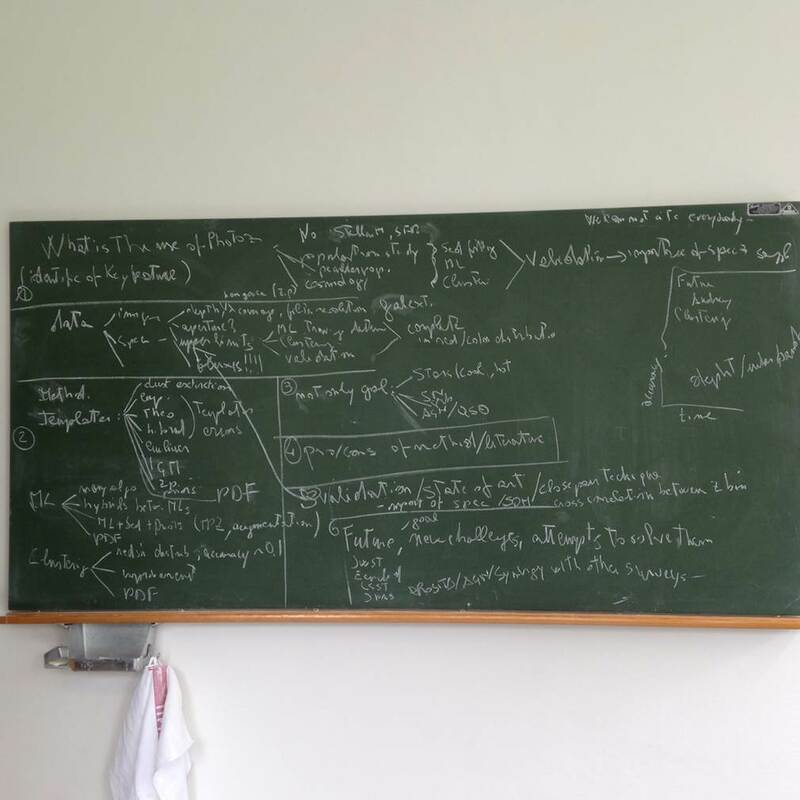 We designed and structured the review on the board in the office of Ben: here you can see one of the outputs of our brainstorming. Indeed we are working together exactly on the problem of photo-z for Euclid, but from different angles and with different interests. Of course, during the process of writing the review, we had many fun, and often heated, discussions about which is the better method: “new and hip” machine learning which is often powerful but used as a black-box, or “old school” but physically motivated template-fitting methods. We are still (friendly) debating it! It was a rewarding experience to write this review because after years in struggling in small technical aspects of our own method, our own piece of code, it was great to see how our efforts are integrated into a larger scientific perspective and to realise how photo-z will continue to be crucial in answering some of the most important questions on galaxy evolution and cosmology. The photo-z method is so rich in term of approaches and scientific objectives that it has been a challenge to fit all what we wanted to say into the allowed number of words and citations required by the journal. Nothing similar exists on the market right now, and we could have easily doubled or tripled the length of the review by including a lot more very important content and citations!. We also learned a lot from each other by writing this review, because while photo-z is one of the fundamental tools of our each of our research, we typically use them in widely different contexts, with very different techniques, requirements and goals! This review helped us to understand the need of photo-z in each other’s, and others’ fields, and we hope that we were able to distill some of what we have learnt into a useful format for the reader. Finally, it was interesting because Nature Astronomy is a new journal in our field and it was reassuring to see the high standard of this journal in term of referee, proof-reading and interaction with the editor and the editorial office. 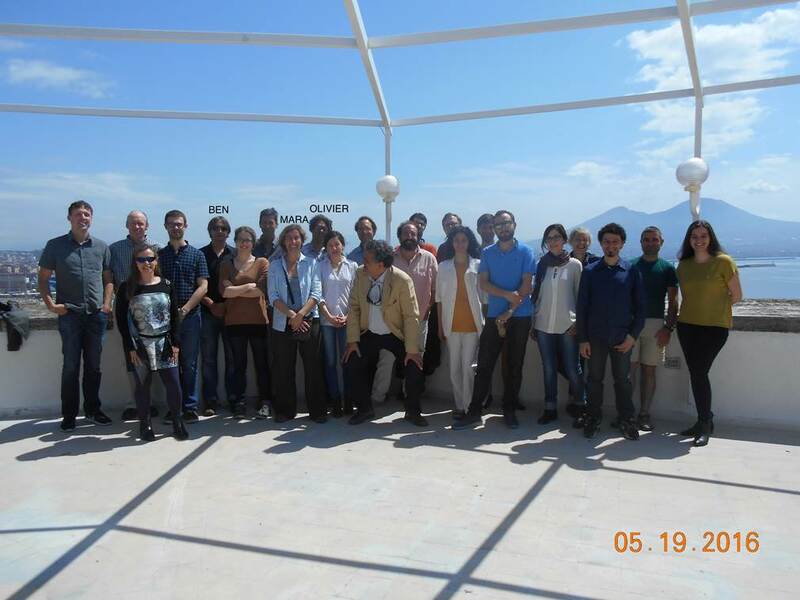 Olivier, Ben and myself together with the rest of the The Euclid OU-PHZ team, during one of the workshops (this time in Naples). What a great 'Behind the paper' post! My favourite yet. So nice to see that collaborating together in a different way can give you a new insight into the work you have been doing for years.